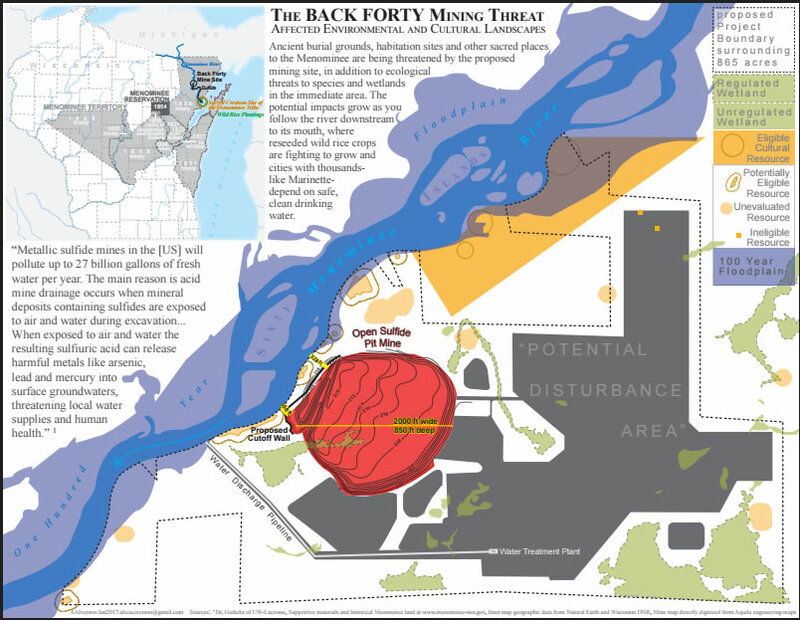 The Back Forty Mine project is a proposed open pit metallic sulfide mine located on the banks of the Menominee River in Lake Township, Michigan. Aquila Resources Inc. (TSX: AQA) ("Aquila"), a Canadian development stage company, is actively seeking the necessary approvals to mine and process gold, zinc, copper, silver and other minerals at the site. To date the Michigan Department of Environmental Quality (MDEQ) has approved three of the four required permits for the project. The Nonferrous Metallic Mineral Mining Permit and the Michigan Air Use Permit to Install for the project were approved by the MDEQ on December 28, 2016. The National Pollutant Discharge Elimination System (NPDES) permit was approved on April 5th, 2017. The permit for wetland impacts is currently under consideration before the MDEQ. The Menominee Nation and many allies including local citizens, local governments, environmental organizations, and grassroots organizations are opposed to the mine, committed to stopping the project and are organized in efforts to bring about public awareness about the harmful impacts the mining operation would have if approved. The Menominee Indian Tribe of Wisconsin, a federally recognized Indian Tribe, is indigenous to what is now known as Wisconsin and Upper Michigan. By the early 1800’s, the start of the treaty era, the Menominee occupied a land base estimated at 10 million acres; however, through a series of seven treaties entered into with the United States Government during the 1800’s, the Tribe witnessed its land base erode to little more than 235,000 acres today. Our sacred place of origin exists within our 1836 treaty territory, at the mouth of the Menominee River which is located in the border cities of Menominee, MI and Marinette, WI. It was here, a mere 60 miles east of our present Menominee Indian Reservation, where our five main clans: ancestral Bear, Eagle, Wolf, Moose and Crane were transformed into human form and thus became the first Menominee. 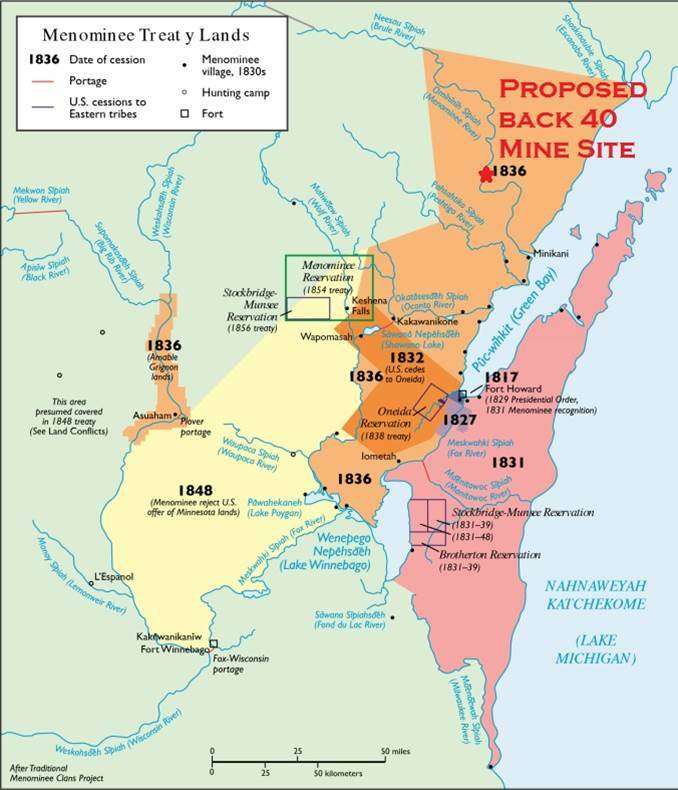 As a result of our undeniable ties and long occupation of the Menominee River area, we have numerous sacred sites and burial mounds up and down the Menominee River, including the area of the proposed Back Forty Mine. Much like our brothers and sister in the NODAPL movement we also know that water is essential to life. The Menominee River is, in fact, the very origin of life for the Menominee people. It also provides life to Michigan and Wisconsin residents and the natural wildlife within the Great Lakes ecosystem. The harmful threats to this area and all who depend on it far outweigh the corporate interests of a Canadian exploratory company and justify the denial of the necessary permits for the proposed mine. The Menominee Nation is steadfast in its opposition to the proposed mine and its commitment to preserving the Menominee River. We ask you to stand in solidarity with us as we continue our fight to protect our place of origin, our sacred sites, the wildlife, water and environment for future generations.